This has been a fun week for me and I have enjoyed sharing it with everybody! 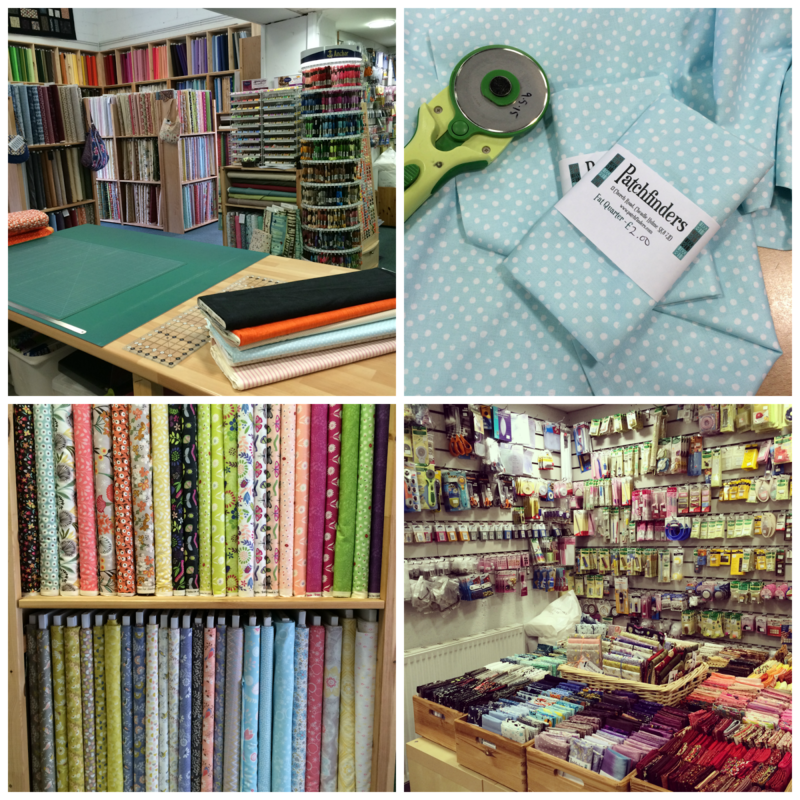 I work part time at Patchfinders quilt shop and happily posted some pictures on Instagram when I was working the other day. It occurred to me while I was snapping away that it's not the fabric and notions that make me love my job (although that helps! ), it is helping people make decisions and pick fabrics for their projects. Everyone that comes through the door is looking for something different, sometimes they have no idea what they want, sometimes they are very particular. They might be searching for a specific colour to match what they already have or need some backing or have never even quilted before! I offer advice and suggestions but of course the choice is ultimately theirs. It may not be what I would choose but I've learnt to understand different tastes and expectations and can guide people according to their needs. One persons idea of 'bright' is not necessarily the same as mine! I love that about my job. Discovering all those unique tastes, seeing how different people are and yet finding beauty in all of it. I find the same to be true of the quilting community and blogs. I might not want the quilt that someone has made on my bed but reading about how they made it, how they mix fabrics and patterns, and how they have quilted it, means I can appreciate all the work that went into it. Seeing other people's quilts inspires me even when I would have done things differently. When I'm planning quilts, projects and blocks, I know that the fabric combinations and patterns I use (whether my own or someone else's) have to 'speak to me', otherwise I am just not excited by it. I might chose colours and mix fabrics in a way that other people think is 'wrong' or just odd and that's ok! We don't have to like everything but then it isn't for us is it (generally!)?! I make things that I think 'work', that I like and that make me smile when I look at them. I hope everyone does that. Knowing that people have made things they love, that they have gone through the whole process of constructing a quilt and are happy with the result, well that makes me happy! Good for you! It is beautiful when it is beautiful to you. For my 52 Quilters block I decided to make something that could represent everything I love. 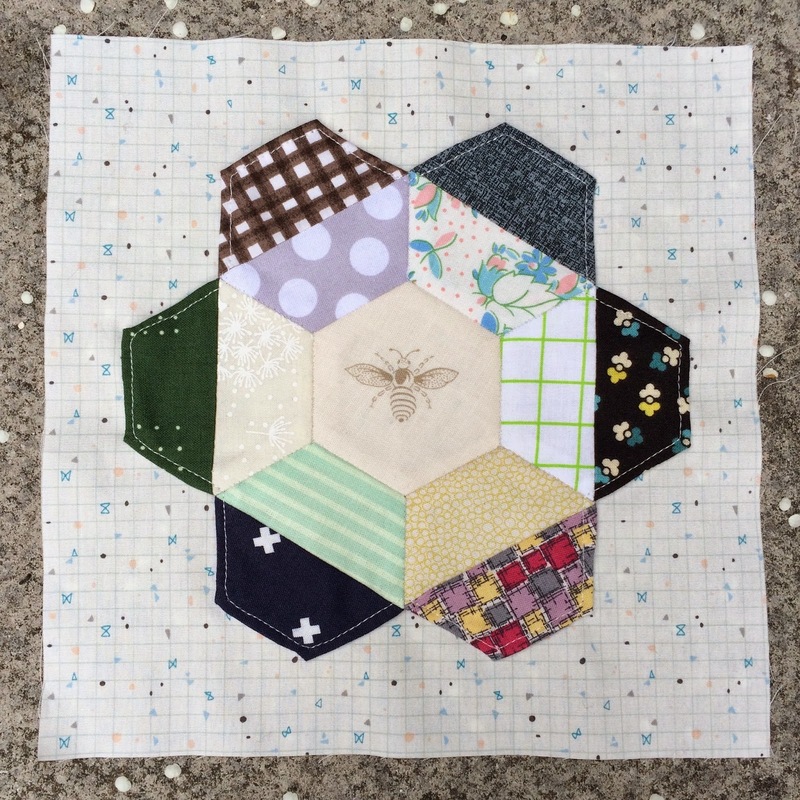 Of course that had to include some English Paper Piecing and after seeing this tutorial by Canoe Ridge Creations I thought it would be fun to machine piece some scraps and then make them into hexagons. I didn't use HSTs (as in the tutorial), just picked out scraps that I knew would be large enough once sewn together. 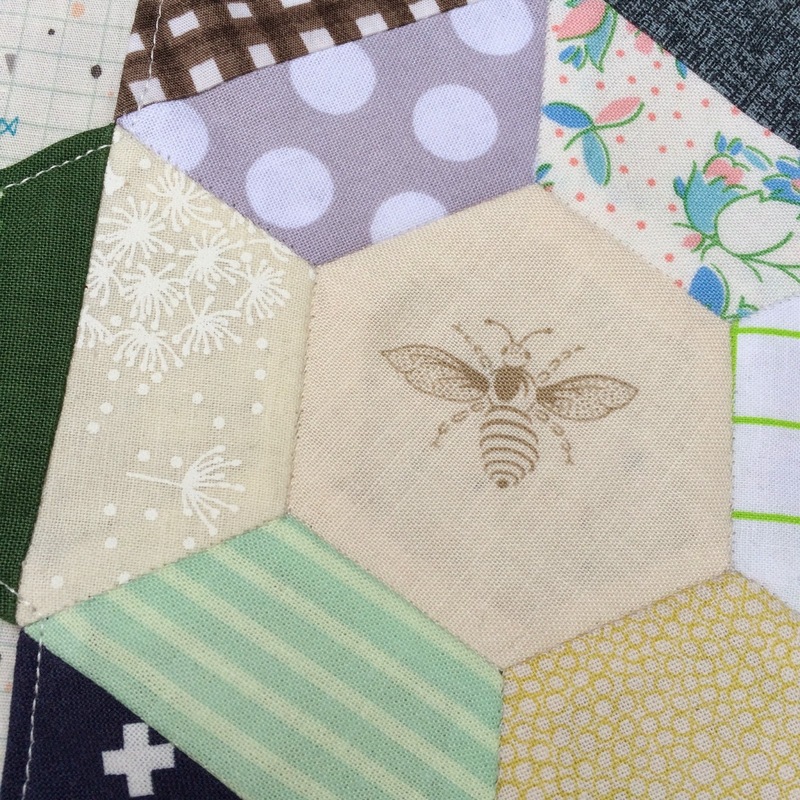 I chose fabric scraps I really love, a gorgeous mix of modern and retro. The centre is a bee, which is the symbol of Manchester. The worker bee represents industry and is a reminder of Manchester's history as the international hub of the textile and cotton industries. I thought about doing hand appliqué but decided instead to do it by machine (it's faster and I have other appliqué to do!) and I like the finished look. This block for me is a culmination of my eclectic tastes, various techniques and the fabulous history of quilting that I'm reminded of every time I sew. I love your 52Q block!